The Easter time celebration is by far the most important in the Russian Orthodox Church. Many of the symbols of this celebration are already familiar to us. The gorgeous folk-art Easter eggs created in the same manner for centuries as a traditional Ukrainian folk art are easily identified by their intricate patterns and colors of red, black and golden-yellow. Equally impressive are the images of the bejeweled and bedazzling enameled eggs created by court jeweler and artist Karl Fabergé. These fabulous works of art were first commissioned in 1884 by Czar Alexander III as a special Easter present for his wife the Czarina. The recipes for these delicacies are involved and time-consuming. 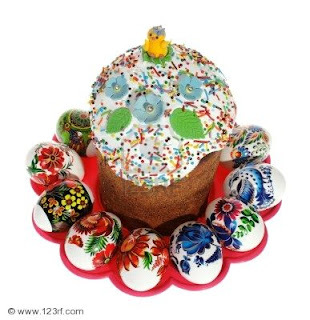 The classic kulich was begun several days before Easter. It contained candied fruit, almonds, and raisins. It was always baked in a special kind of pan-- tall and cylindrical, sort of like a coffee can. When the cake was done, it was decorated with white frosting drizzled down the sides. On the side, spelled out in pieces of candied fruit, were the letters XB, representing the Cyrillic letters for "Christos voskres" -- "Christ is risen." Next to the cake was the paskha, presented carefully molded in a triangular shape. The letters "XB" were also inscribed on this creation. Creating this delight took hours-- it requires weighing down "pot cheese" with a heavy board to drain the moisture and then pressing it though a sieve before the other ingredients were added. The mixture contained more nuts and fruits, vanilla flavoring and sugar.